The nowhere-to-go phenomenon arises when a person accused of international crimes remains free in his own country, yet avoids travel for fear of arrest abroad. It's a phenomenon said at various times to have constrained any number of figures, from Muammar Gaddafi to Henry Kissinger. A twist on the theme is playing out now in the administrative courts of France. Call it the nowhere-to-stay scenario. Since then Habyarimana's been living for the most part in France, but without regularized status. She's twice sought a carte de séjour, a French residence permit; her 2d attempt is now pending before a court in Versailles. The prefecture's denied her request, asserting that the 69-year-old widow is a "menace à l'ordre public," or "threat to the public order." The claim's based on Rwanda's longstanding warrant for her arrest, which contends that she was complicit in the 1994 genocide. As detailed in this Guardian article, she's alleged to have played "a central role in political decisions during the first days of the genocide." 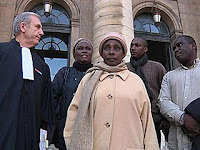 To date France has not complied with a Rwandan request for her extradition. A 2007 partie civile suit against her remains pending in France but has not yet resulted in charges. And France has not regularized her status, either. The tribunal's decision on her latest request for residency status is expected on September 20.